Hey everyone, my name is Kobe! 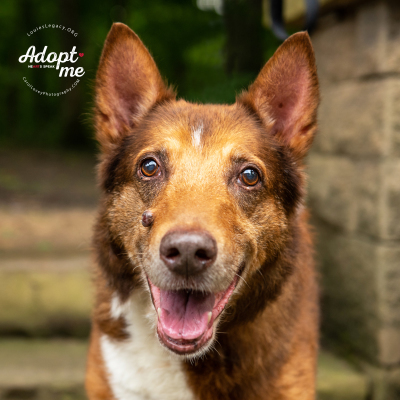 I am a 10 year old, 60 lb Collie/German Shepherd mix. I had a rough go at life before coming into rescue, I have arthritis and was having trouble walking at all. Now I take a daily medication and get around so much better! Due to my arthritis, I would do best in a single story home with a flat yard. I also LOVE short walks where I get to investigate all kinds of new smells. My foster humans have never put me in a crate, I mostly just nap until the humans get back home. I hold the record for zero accidents at my foster home, basically I am the best dog ever. I love following the humans around the house, walking around outside, and lounging on my fancy orthopedic bed (which comes with me when I get adopted!). I am also a very quiet dog, I pretty much only bark if I see my own reflection when I look out the window. I get along very well with my two foster dog sisters, but I think I would get overwhelmed by any young puppies with a lot of energy. If you are looking for a quiet, calm companion, please consider adopting me! I may be a senior dog, but I still have a whole lot of love to give!